Long white sandy beach located on the other side of the Gapang Beach, shallow area is covered with small coral formations, home to a variety of critters. Lots of sandy areas provide a perfect environment for learning to dive or night time diving. 50 meters out, the channel between Rubiah Island brings in great currents, which make learning to dive with currents, an easy option. Volcanic boulders line both sides of the channel making it a great house reef for learning or diving alone with your buddy. Old Gapang Beach dive site, shallow to almost deep dive on the third pinnacle, let the variety of creatures here to surprise you every time you dive. Its just only a walking distance dive site and easy to access you can enjoy it any time of the day with or without guides. Also one of the best spots for night divers or training. Sandy bottomed area with coral heads and a big range of stunning tropical fish. The wreck 134 meter long, the Sophie Rickmers is an impressive wreck, situated in a sheltered bay. On May 1st, 1940 she was scuttled by her own crew, one of 5 ships confiscated by the British in the waters around Pulau Weh. This dive is done as a decompression dive, so “experienced divers only” minimum advance open water and rescue divers with 100 dives plus and must be comfortable at depth and decompression procedures. The top of the wheelhouse is at 37 meters, the decks around 45 meters and the straight bow resting on the bottom lies at over 55 meters deep. Normally done in conjunction with the Sabang wreck (6) using the same tank, this dive offers up an interesting topography and gives you 2 shorter dives for the price of one. Abnormally warm water due to thermal activity and rising bubbles makes for a fascinating dive. Marine life that enjoy warm waters not often seen, like the soft shelled turtle make for a dive that one never knows what. A tug boat lying close to shore, this is a great 2nd dive, combined with the volcano dive. Lots of very healthy hard coral attached to the wreck and a nice reef close by make for a fun, shallow dive. Thai boat at about 26 meters, you can see frog fishes. Usually dived at full moon time when currents are strongest, this advanced dive is one of the best places to see mantas and school of milk fish. At the shallow water there is cute table coral. Gentle, shallow dive site, although there can be an occasional current. A large, sandy bottom covered in rock and coral formations, soft and hard, with a variety of reef fish. Garden eels are usually visible and the occasional turtle comes by to say hello. Dive site slopes down into the depth, but it’s usually dove as a shallow dive. Can be arranged for the night dives. Strong currents often rip along this gentle sloping dive site covered in volcanic rock and boulders. Chances of seeing black tips and white tips plus marble rays are hi in every season. Another amazing spot for lots of schooling fish (Giant trevallies, barracudas, sharks and rays, off the reef the depth could goes up to 45 m with a sandy bottom and sometimes mild current. The west coast of Seulako Island, heading towards Arus Paleeh. Gently sloping, topography of volcanic rocks and coral heads. A variety of reef fish, the occasional pelagic, and mild currents make this a very beautiful dive site. At the southern end, a large overhang between 12-15 meters makes for cave like conditions with an easy entry/exit, where the ceiling is covered in beautiful corals. Great for finding the small stuff. Similar to the western side of Seulako Island. Gentle sloping topography with coral heads and volcanic rocks in the shallows. Sloping down to depth. Marked by a set of rocks jutting from the sea, this dive site offers a deep sloping wall covered in gorgonian sea fans that connects to shark plateau. Strong circular currents often offer up a variety of pelagic including white and black tip sharks, trevally, barracuda and a variety of rays. Highlights of this dive are a shallow wall at 12-18 meters, that a house an amazing number of different types of moray, as well as the normal small critters found at very healthy dive sites. A World class dive site Mostly visited on early morning ‘shark dives’ and when diving Tokong a little bit deeper, with stronger current most of the time. This is a sandy plateau area where spotting sharks (silver tips, gray reefs, with and black tips) are usual, plus whatever pelagic may be in the area. Rarely dived due to some very large circular currents, the shallows are filled with large boulders covered in corals and own deep, some very healthy gorgonians gardens. One of the top 3 dive sites in Pulau Weh. Large, sandy patches are followed by a deep west wall covered in nutrient rich gorgonians that drop to the 60 meter range. A small overhang/cave starts the wall. Proceeding east, two large rocky outcrops ranging from 10 to 30 meters are separated by 2 canyon channels, 5 meters wide that provide a break from currents and offer great places to view amazing marine life. In the blue, dog tooth tuna, barracuda, trevally, jackfish, napoleon, african trevally and unicorn fish are common, with shark siting fairly common. Finishing up the dive in the shallows are volcanic sarsens covered in the small stuff, and one of the best places to find new table corals that are flourishing post tsunami. Another top 3 dive site, offering a deep reef covered in gorgonians. Everything can be seen here, even orca! More suitable for experienced divers due to depth, this is Pulau Weh at her healthiest. Large trevally, jackfish, and giant barracuda are often schooling in the blue or near to the reef. In season, a great area for schools of devil rays. Not often dived due to the distance, a good place to see massive table corals on 20 meters up. The site not so deep on 25 meters we find the flat sandy bottom. In this site good to see macro staff, especially nudiebrach, cowrie, cuttlefish, etc. 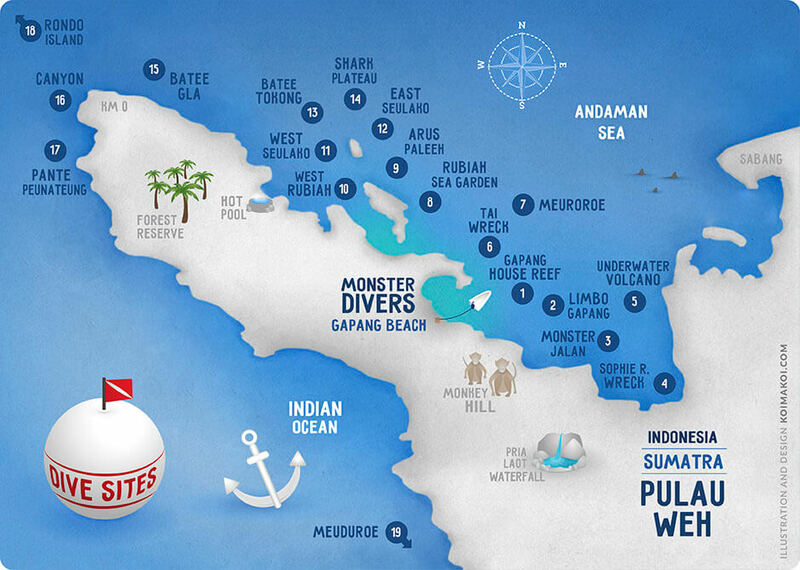 One of the most Advance and challenging dive site around Weh island due to its own topography and circle currents. Perfect place for Advance Divers and above with minimum of 100 logged dives. Not to mentioned that this is one of the best spots in terms of being untouched and unique for all the big stuffs in large numbers..
One of the most stunning dive sites for table coral reef, with the down slops to the greater depth, Monster Divers lady Kraken has the schedule twice a week for this trip, its located southern tip of the island.. The amount of schooling fish are countless and also absolute chances of encountering big pelagic stuffs. Normally started in a sandy area covered with coral heads to 18 meters, the current then picks up offering a chance for pelagic. A nice place, if lucky, to sight mantas. .
Our equipment are regularly up to date according to international standards, brand new equipment and brand names from Spain and other part of the world who only focus on quality of diving. Maintenance and often checks and replaced according to strict professional standards would almost reduce the chance of risks and hazards to zero. Maximizing our eco friendly attitudes is our aim, therefore all the soaps and detergents used in our boats and diveshop are biodegradable.